Nic Dowd extended his point streak to six games with two assists and Sean Backman buried the game-winning goal late in the first period to propel the Ontario Reign (24-10-2-1) over the San Jose Barracuda (18-12-5-3) 2-1 at SAP Center Saturday evening. The Reign kicked off the scoring 12:31 into the contest as defenseman Kurtis MacDermid buried his third goal of the season in his first game back in the lineup after serving a 12-game suspension. The Barracuda responded at 16:52 when forward Trevor Parkes slipped a shot between the legs of Reign netminder Peter Budaj (18 saves). With the period winding down, Reign forward Michael Mersch found Backman streaking down the right side for his 10th goal of the season, beating Barracuda goaltender Troy Grosenick (23 saves) at 19:11. Dowd assisted on both of the Reign goals. 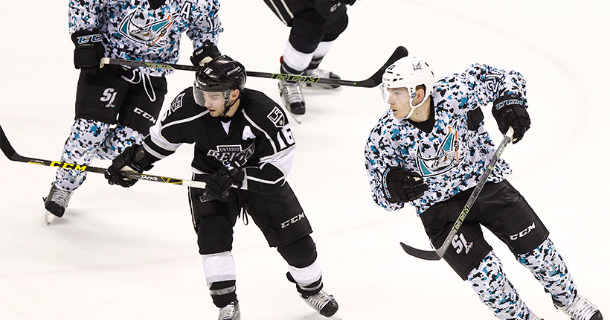 Over the next two periods, the Reign defense held the Barracuda to eight total shots to preserve the victory. The Reign finished the contest 0-for-4 on the power play, snapping a five-game power-play goal scoring streak. The Barracuda went 0-for-3 with the ma advantage.